While some friendships are as a result of the coming together of similar personalities, others are made up of the strangest of characters. This is the case when two animals from different species meet and form an unbreakable bond of friendship. The interspecies friendships are not only strong but also cute, a factor that makes them a source of inspiration even for humans. There have been several instances where animals of different species developed unbelievable bonds, with some interspecies friendships being termed as adoptions. Here are some of the cutest interspecies friendships of all time. Since cats are generally known to hunt rats, the interspecies friendship between the two animals may seem strange. However, in one of the cutest interspecies friendships, a cat named Ranj and a rat by the name Peanut became besties. The two would eat alongside each other, cuddle and follow each other around. A lamb that had been rejected by her mother found a friend when she was taken to an orphanage in South Africa. 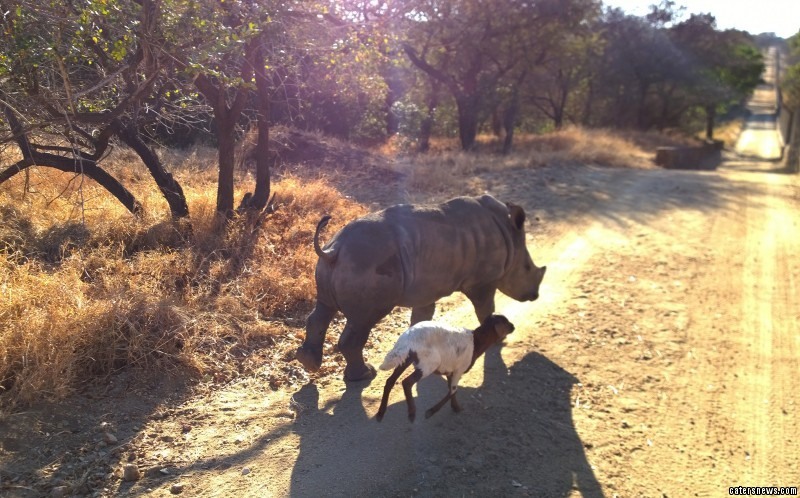 The lamb was housed in the same space with a young rhino, a factor that led to a strong and beautiful friendship.